Sixpoint has been right in the middle of the spectrum. One was slightly less than average, and the other was slightly better than average. This one could be their breakout hit, right? I'm not sure that the energy drink cans or the strange names are doing these beers any favors, but packaging and marketing are not what I'm about - I'm about drinking and appreciating beer. The beer is a cloudy orange with a head that boils off to a thin trickle of bubbles with a familiar ring around the edges. The aroma is oranges, a bit of bread, and graininess. The delightful hops are really inviting, and the smell is just enough without being harsh. If the taste matches the smell, this might be the best Sixpoint yet. 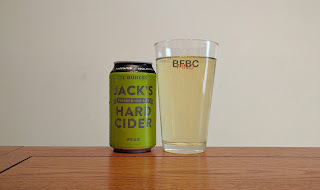 I tried the hard cider that Jack made for Helen, and it was okay, but I was far from impressed. This one is made from pears, so it might be just wacky enough to be unique and flavorful enough to be good. I have no reason to think that Jack doesn't have it in him to do great things, so I expect this will be a magical experience. The beverage is surprisingly shaded as pear juice. Could it be that this isn't actually apple cider, and it is pear cider instead? I hate to say it, but I kind of hope it is. I like new things, and that would be a very new thing for me. The carbonation pretty much is like the last one, as it fizzes, but it does not have any kind of staying power. The aroma is a very slight hint of pear at the fringe of wine. I might even just say that this is a white wine, if I didn't know what Jack said it was. I'm not sure what to make of all of these special large-bottle Angry Orchard hard apple ciders. The fact is, the two that I've already had have given me the impression that these larger, smaller batch bottles are just not as good as the average Angry Orchard offering. If this one continues the trend, I may just stop buying them on principle. The deep gold beverage is clear as a bell and has a surprising head when it is just poured. The bubbles are big and energetic, so they fizz out fairly quickly. Still, not all is lost, as the ring of bubbles that accompanies so many beers is present here - and it's a welcomed sight. The aroma is more apple juice than wine, but the wine aroma is in there with it, that is unquestionable. I don't know why I got a bunch of these Belgian beers lately, but I'm on a kick, so don't try and stop me. This one made it hard to find the actual brewer's name on the bottle. 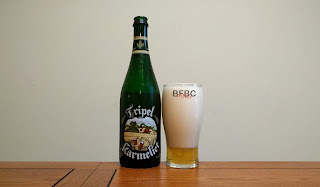 Normally, it's in big, bold letters on the front, but this one just tells me it's a Tripel Karmeliet (Dutch for Triple Carmelite). I don't know why they are hiding. The faintly hazy golden beer has an aggressive white head that wants to take over the world. I swear, I poured this slowly down the side of the glass, and THIS is the head that it arrived at. Five minutes later, it was down about half, so I poured in some more beer; seems like this is going to take some time for me to get into. The aroma is distinctly blonde with cold grains and wheat blowing in the breeze. I had two Belgian ales recently that were both good, but they weren't what I wanted to get from these things. I want an abbey ale that brings back the goodness of the best of the bunch. 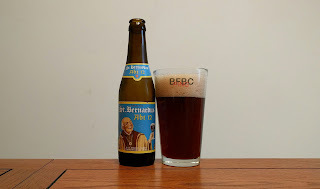 This one has a downright comical picture of a monk... and having known a few monks, this is exactly the kind of thing they would pick for the front of their beer. The color is a deep, deep brown with a dense center that doesn't let light through at all. The head is big and frothy, but it's not dense. The bubbles are big, but they have staying power. Eventually, the head dissipates to a thick enough uneven pillow across the top of the beer. The aroma is oak, thin bread, and a stronger kind of astringent smell. It's unlike previous Trappist Ales, but I'm still looking forward to it. From the sleepy town just north of Gettysburg, Pennsylvania comes this beverage that was named after the wife of the blended it, so he must like it. If it's that good, I am looking forward to it. 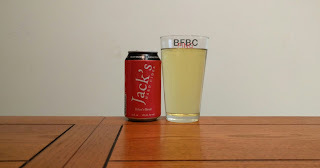 I know I swore off of ciders a while ago, but I ran into a few more recently, so I'm just going to try them and write them up, okay? The color is a very pale yellow (looks like someone has the right amount of water intake). Even in a perfectly clean glass, there are many points of nucleation that cause lots of streams of bubbles going to the top, and they show no signs of going away. The aroma is apples, but they are kind of sweet-tart to the point that they almost cancel each other out. 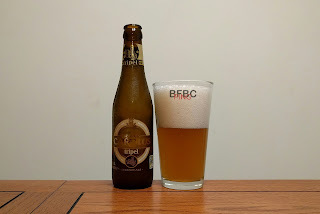 Another Belgian beer with an exotic name, a frothy head, and a nutty font that makes me wonder if they actually want people to read the label at all. Why don't they just go with Comic Sans, as they have such a distaste for the pleasure of the readers of their labels? The fluffy white head sits atop a very cloudy golden beer with an aroma that smells of lemons and fresh, unbaked dough. The presentation is better than the last Belgian beer I had, so it may get better than the 2.5 that it got (although it was a dubbel). These Belgian beers have a special place in my heart. They all have flowery fonts, they are steeped in history, and they imply that they are all made by monks who do it for the love of beer/God depending on the monastery. This beer is another that also has a name I can probably pronounce, if there was a gun to my head, but I didn't even try when I picked it up. Despite what the picture may tell you, this is not black. There are no linguistic gymnastics necessary to call it ruby or so-dark-it-appears-black or something along those lines. Instead, it is definitely ruby red; it's a DEEP ruby red that absolutely allows photons through right in the center. The copious head is thick and full, and it is a prime example of the heads I tend to see on these Belgian beers. The aroma is strangely ginger and sweet malt. 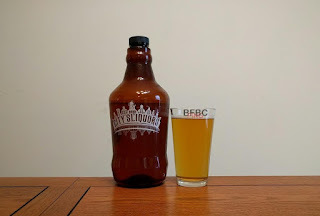 One of the best beers I've ever had was a Scottish-style ale produced by Stoudt's Brewing in Pennsylvania. Any version of the beer since then has been directly compared and generally found wanting. Maybe this beer from a very small town in TN will evoke the same feelings. 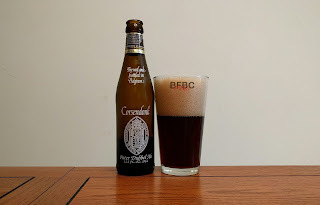 The beer is a deep red with a very minimal head that never quite goes away completely, but it is actually very surprising how little head there is immediately after the pour. The aroma is wood and grains. My hope to repeat the joy of previous beers of this style is still riding high. First sip is pretty watery. There's still wood (not oak, but wood) with a bit of caramel and something else lingering under there, but it's pretty nuts how little flavor these is. This beer needs to be more. Speaking of nuts, though, I think I tasted a bit of a nutty flavor in there, but who knows for sure? Time to dig in with a full mouth. 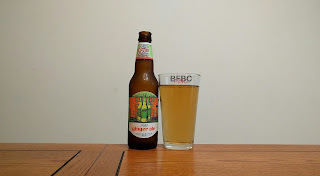 Angry Orchard has been the best of the hard cider brewers. The last one I had that was specially bottled like this was the worst of the bunch, but I assume it is because these are more experimental than the ones that come in six packs; I'm fine with a skilled artisan trying new things in small batches and letting me try them. The deep gold beverage boils its head away completely. The aroma is more wine-like than pretty much any cider I've encountered so far. It absolutely reeks of white wine. With it's ABV of 10%, it's already pretty wine-like, so I guess I shouldn't be too surprised. Is this just another cider to drop into the list? Well, I assume the special packaging implies it should be set apart. Another beer from a brewer I've never heard of. It seems like this situation happens a lot, but I'm never more likely to find a good beer than when I... decide to open one, I guess. A black IPA, like a black lager, is a strange beast that is really, really hard to get a handle on. I take each beverage as they come, though, so let's dig in. The dark caramel colored beer sports a thin tan head that leaves lacing as an after thought. The aroma is more malty than hops, and that belies the claim that this is an IPA. They know more about brewing beer than I do, I'm sure, so I'll take their word for it. I only know about drinking beer, and that's what I plan to do. Alpine has had a good run - let's keep it going. This one is a wheat beer, and I have had a checkered past with wheat beers. This promises a bit with the addition of vanilla (which is featured by the name, so I expect it to potentially even overwhelm the beer). The slightly cloudy, pale yellow beer doesn't have much of a head once it's poured, and then it dissipates even more. Eventually, the bubbles are a semicircle of stragglers. Points of nucleation continue to generate bubbles coming to the top, but their lives are short. The aroma they accompany is almost nothing. I can sense vanilla and grains, but they are on the very edges of smell. Never heard of North Coast Brewing Company, and that means I must love them. I love any new brewery, as they give the me opportunity to try new beers from someone who thinks they have something special. Occasionally, they do, and that's a win-win. This beer supports Jazz education, so I like to think of this as my little exercise in philanthropy. The beer looks almost brown at first glance, but putting some light to it, it glows a ruby red. The relatively thin head is a ring around the top with a few small patches floating freely. The aroma is sweetness, dark fruits, licorice, brown sugar, raisins, and wet bread. It's certainly complex as hell, and I'm pretty sure a sip won't cut the mustard, but I have a process, so I'm doing it. Third in my Mill Creek series, and the other two were definitely better than your average beer. If we start a pattern, I'm going to have to really keep an eye out for the local brewer. I assume they'll make more than the three beers I was able to find at City Sliquors (my favorite beer and liquor store) and I look forward to trying them all. But, the lager is up now. The color is a hazy, deep gold. The head is pretty thin, but it's there, striving valiantly to be as much as it can be. The aroma is... missing. I stuck my nose pretty deep in there, and I can't smell a damn thing. I guess that's nothing major for a domestic lager, but I really expected something different from the craft brewer from Nolensville, TN. My second Mill Creek beer, and the first one was surprisingly good. While 3.0 may not seem like the greatest beer out there, my rating scale is documented, and anything over a 2.5 is better than average. The fact that this brewer is in the relatively small Nashville suburb of Nolensville means I just didn't expect beers to come from them that tasted like they could be larger, more established brewers. It's a very hazy orangish brown with a patchy head that leaves pretty much no lacing joy. That's okay, I'm not here to stare at it. The aroma is wheat and grains more than anything else. My experience with these ales is that they are pretty smooth drinking, and I can pretty much knock back one after the other because they are so damn drinkable. I was gifted this beer by the fine folks at City Sliquors who I go on and on about all the time. 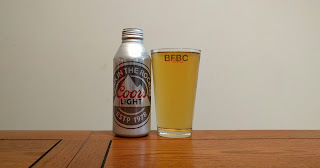 They didn't brew it, so I don't feel any particular obligation to give it a good review or anything, but I wanted to be up front about the fact that I didn't have to pay for this beer, yet I'm going to review it as if I had. I will definitely want to thank Jeremy for the hook up, though. The beer lacks significant carbonation while in the glass. It was definitely there when I poured it, but there is very little going on from a point of nucleation perspective. Still, a thin puddle of bubbles forms in the middle of the top well enough. The color is mostly golden yellow with a very slight orange tint. The aroma is very heavy malt filled with warm rolls. A leftover from when my sister-in-law and brother-in-law visited, I figured I would go ahead and see what they found alluring in this mas produced light lager. The fact is, I haven't had one of these in many, many years, and it's possible that it's better than I remember. At the very least, it's paid for already, so that means it meets the requirements I had back then. Yellow and headless, this beer is a combination of the worst traits of Ichabod Crane and the Headless Horseman. The aroma is stronger than I expected with sweet malt, lemon, and bread. Did I say sweet? Because it's particularly sweet. 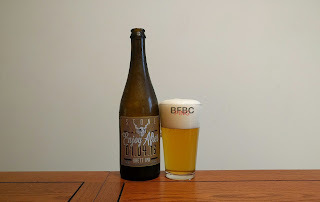 I genuinely didn't expect anything from the beer, based on very distant experience with it, but I was WAY younger then, so my memory is just failing me. My recent experience with brettanomyces yeast has left me questioning this beer. Mind you, I have waited a year to drink this, so I'm going to freaking enjoy this, come hell or high water. 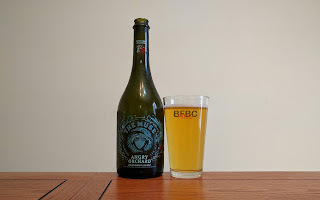 The most similar beer to this (in theory) was the very good Stone beer of a similar name (two, actually), but from the other direction, as it was billed as being best when drunk as close to the date it was brewed. This one, however, makes me wait. It tasks me, and I shall have it. The yellow beer with the sticky, gloppy, delightful head smells of light grains backing the overwhelming yeast. I'm not surprised that the beer is overwhelmed by the yeast - the other beers suffered the same fate at the hands of that sour, strong ingredient. As far as I know, this is the last of the Coney Island beverages, but I could be completely wrong. I can tell you that this is the last one that my local store had, so it's the last one I try until they have others. Their hard root beer was very good, and their orange cream ale was very interesting, so why not try the ginger ale? The beverage is the color of ginger ale - a kind of toned-down apple juice color. While it has carbonation, it has pretty much no head, and that's probably as it should be. The aroma is sweet ginger ale and a bit of a sting of alcohol. I'm starting to think that they just add alcohol to the process, and that's all there is to it.